I'm celebrating with my family at the lake here in Michigan. The sun is shining. The birds are chirping. We are going to start the day with a long bike ride along the lake. Then a little beach time, followed by another bike ride into town to watch the parade. Back to the beach for the 2nd night of fireworks tonight. (and especially those who fight for it for each of us). I'm linking up with Cara, from The First Grade Parade for Throwback Thursday. So many beginning readers seem to experience b and d confusion. Many of the teachers who helped me learn to teach reading use the "check your bed" strategy to help students distinguish between b and d. I recently made my own signs to use to prompt students who are confused when they get to a word with a b or a d.
Click on the image below if you'd like to download my signs (the 2nd one is a real photograph). This is what I say to a student when he/she is not sure if a letter in a specific word is a b or d.
1. Is that a "b" or a "d" in that word? 4. 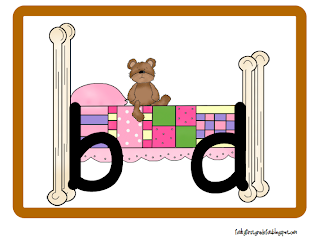 Does the letter in the word look like the b (at the beginning of bed) or the d (at the end of bed)? Did you know that you can create short urls with AdFly and receive cash from every click on your short urls.